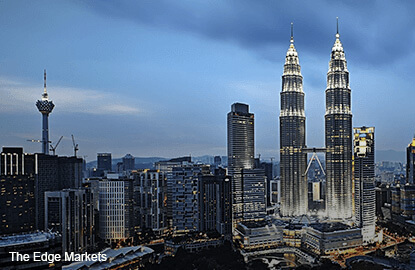 KUALA LUMPUR (Feb 15): Malaysia's economy is expected to have grown at a faster pace in the fourth quarter, supported by its oil and commodity exports after over a year of tepid global demand that bodes well for a more durable recovery over 2017. Rebuilding confidence in Malaysia's economy is key for Prime Minister Datuk Seri Najib Razak as investor morale has been shaken over the past two years due to ebbing demand from major trading partner China and a corruption scandal involving state fund 1Malaysia Development Bhd (1MDB). The median forecast in a Reuters poll of 14 economists was for 4.5% annual growth in October-December, better than the 4.3% expansion over the previous quarter. The forecast matches the growth rate achieved in the fourth quarter of 2015, and some economists say the positive momentum puts Southeast Asia's third-largest economy on track for a modest recovery. "The industrial production side was obviously stronger, especially in mining and manufacturing and this was helped by the pick up in exports," said Singapore-based Nomura analyst Brian Tan. Malaysia, an energy and commodities exporter, snapped five quarters of declining growth in July-September, and Najib said in October that the economy will grow between 4-5% in 2017. In January of last year, the government revised Malaysia's full year 2016 growth target to 4.0-4.5% from 4.0-5.0% following the sharp drop in global crude oil prices. But there are signs of a pick up in external trade with December exports up 10.7% on-year on a strong recovery in shipments of crude oil, petroleum products and palm oil and palm-based products. Sustained private consumption and resilience in the services sector "provide encouraging signals that recovery will sustain in 2017," UOB economist Julia Goh said. A fragile ringgit currency, however, and lingering uncertainty around President Donald Trump's economic and trade policies pose risks to the outlook, analysts say. The ringgit tumbled sharply towards the end of 2016, prompting the central bank to clamp down on offshore ringgit trade and introduce other steps to boost onshore ringgit trade. Those headwinds prompt some caution among the likes of Ket Ee Sia, economist at Hong Leong Investment Bank.